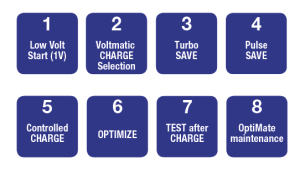 OptiMate 5 VoltMatic can SAVE & CHARGE all 6V & 12V lead-acid batteries. Simply connect the charger to the battery, the VoltMatic micro-processor automatically makes the correct charge voltage selection for a 6V battery in any condition or healthy* 12V battery and then proceeds to charging. * Manual over-ride for very low voltage 12V batteries is available.